4 hours - $60 Instructor fee and $20 Supply fee* (includes steam set) Location: TBD This course introduces a variety of silk, silk dyes and paints. The techniques demonstrated are watercolor, wet on wet, salt, resist application, and diffusing with fabric softener. You will design and paint a silk satin scarf using any of these techniques. Your creation will be steamed to lock in the color and ready to pick up the following Friday from “Imaginations”. 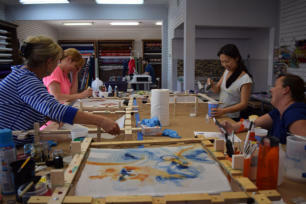 Come create on silk in a relaxed and enjoyable environment. *Note: Please pay the supply fee in cash during the workshop. If you have questions please send an email to me. Look forward to having you in the workshop.